In India, we see Ganesha the remover of obstacles in every single temple and most Hindu homes. He is considered to the wise one and remover of all obstacles. 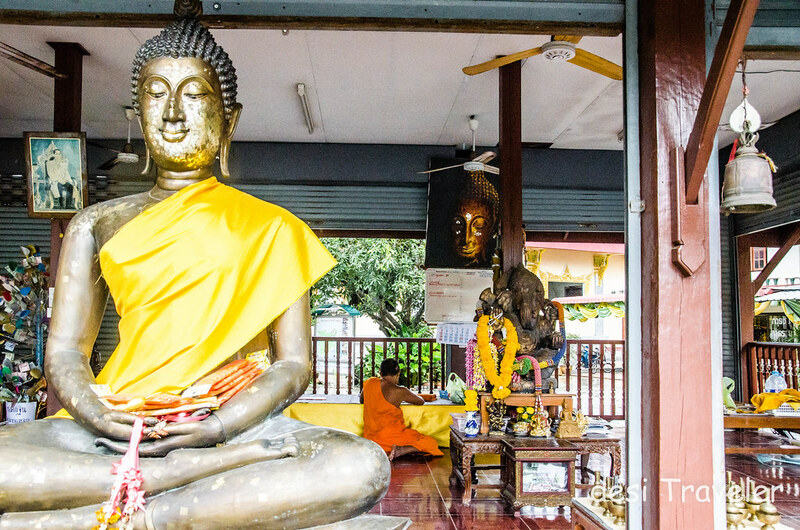 When I was visiting Thailand more than a decade ago I was happily surprised to find Ganesha being worshiped in almost all Buddhist temples in Amazing Thailand also. Not only in temples, I found Ganesha idols in front of various homes, shops etc. in Thailand. 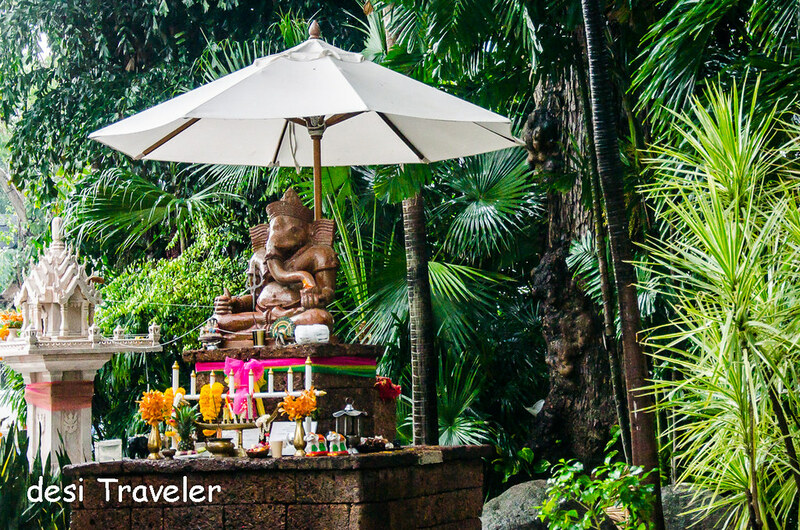 In Thailand, Ganesha is called Phra Phikanet, but his importance is the same as in India. So on my last trip to Thailand, I clicked Ganesha in Thailand wherever I found him, and trust me he was everywhere. So dear readers as the first post of 2015 I give you some Ganesha Pictures clicked in Amazing Thailand. The first one is from Koh Samui island and was clicked outside a shop in the Fisherman’s village on Bophut beach. It is a common tradition in Thailand to pray with incense sticks and offer food and beverages to gods, and you can see the same here in this picture below. 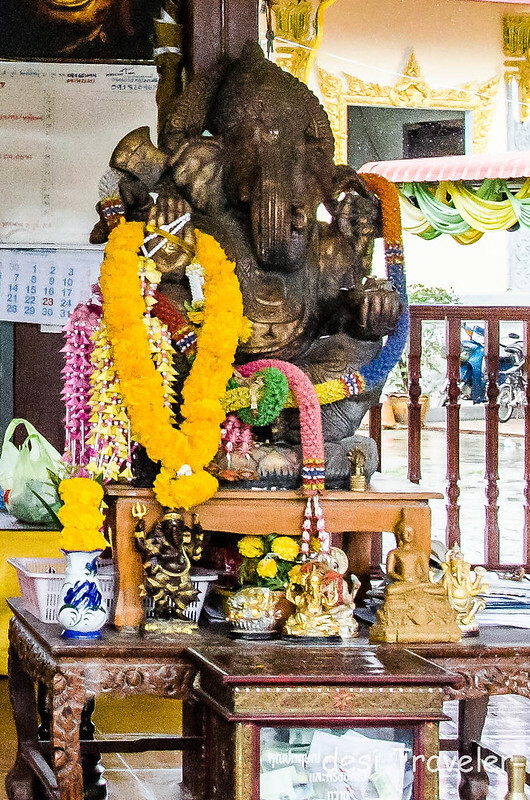 In Koh Samui while visiting a Buddhist temple I found this idol right behind a Buddha, and if you look closely you will find many small idols also in front of the large Ganesha. 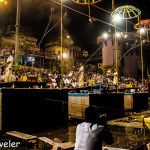 Check the second picture which is the cropped one to see the smaller Ganesha Idols. 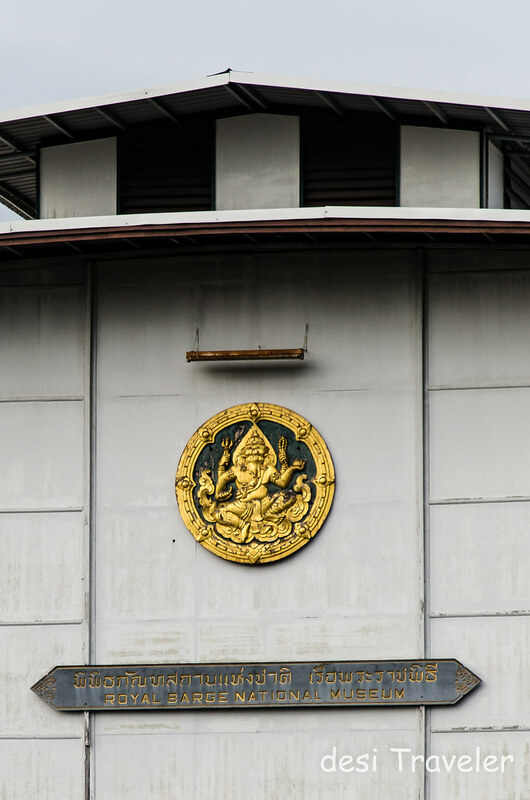 One of the most iconic Ganesha I noticed was on the wall of the Royal Barge National Museum on the banks of Chao Phraya River while on a river cruise. I only had a small lens with me and was not sure what the icon was till I saw the picture clearly in the camera. 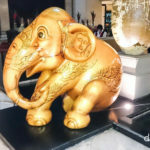 And finally, this last one is from the entrance of Anantara Riverside Resort in Bangkok that had this ancient looking Ganesha at the entrance. 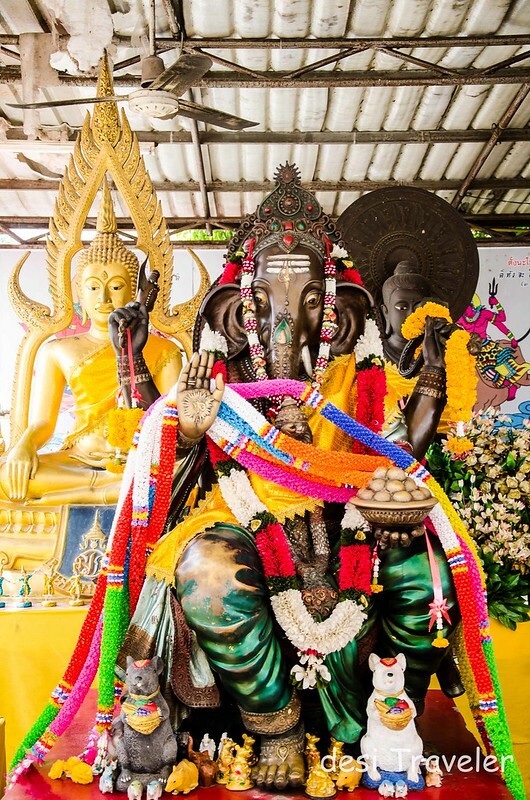 Ganesha may be addressed as Phra Phikanet or Phra Phikanesuan in Thailand, but he is equally revered and worshiped as God of Fortune and success and remover of Obstacles just like in India. 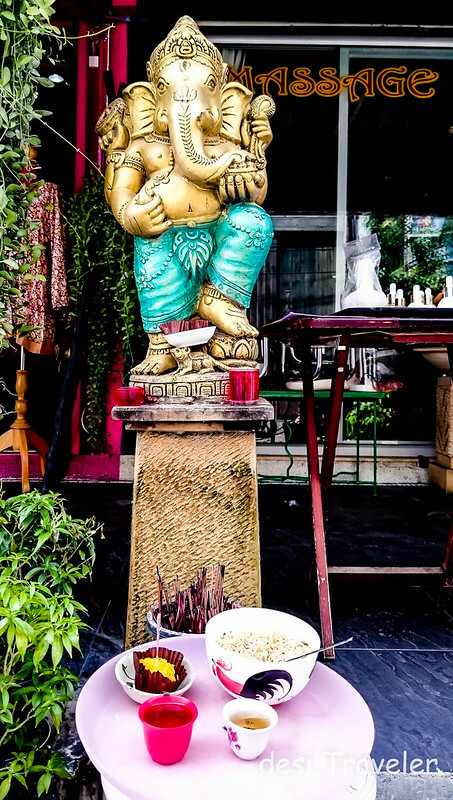 You will find Ganesha idols in Thailand in temples, in front of many shops and homes. 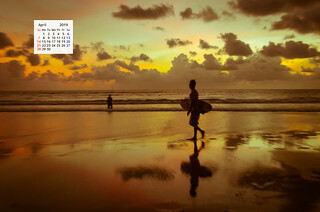 With this dear readers I pray that Ganapati will bless you and your family in the New Year. Wishing you all a very Happy New Year may Ganapati full fill all you benign desires. I visited Amazing Thailand, on an invitation of TAT New Delhi. I love Lord Ganesha and was thrilled to see all the lovely Ganeshas in Thailand! Warm Vinayaka Chathurthi wishes to you. 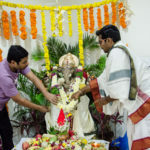 I love Lord Ganesha ..and I loved your post on Him.Even as Vinayaka Chathurthi is being celebrated across the country I am happy to have found your blog. Very interesting. 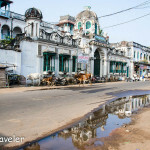 Thailand has very close cultural ties to India going back 1000s of years. In fact recently I came across pictures of Thai MahaRajguru who came to seek the blessings of Sri Shankarachary at Kanchi peetham. Along with your Ganesha images, it fills my mind with awe! It’s so interesting to see Ganesha sitting next to (or in front of) Buddha. I wonder how they feel about each other placed that way? Having been brought up monotheistic (Catholic) the idea of worshipping many Gods seems so foreign to me, but also quite interesting. I really like Hindu mythology event though I still mix up names and stories. Actually in Hindu faith also the supreme God is only one all others are just his forms and manifestations to help we lesser mortals be able to connect to him. Not very different in my opinion like a lot of people in Christianity pray to various Saints, Mother Mary and Baby Jesus and Angels. While I am no expert but that is what I interpret, with no intention to hurt anybody’s sentiments or belief. Very fascinating. 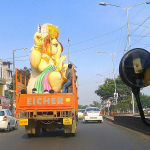 Didn’t know that they were big on Ganesha too. Great article and amazing pics. Thanx for sharing and Keep Travelling.